The Odeon IMAX Cinema Gateshead is situated in the all new ‘CUBE’ yellow mall of the Metro Centre with excellent car parking, bus and train links. 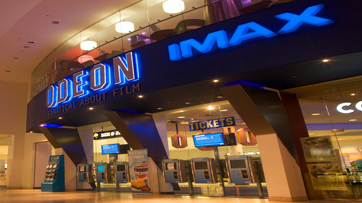 The brand new ODEON IMAX Cinema is now in Metrocentre Qube. With luxury, premier and standard seats available, the 12 screen cinema offers a VIP area, 3D screen and the first IMAX screen in the Region. Gallery tickets are available and include free soft drinks and popcorn plus extra wide seats and exclusive access to a VIP bar. After the film you can enjoy a meal or a drink in one of the many nearby eateries including Nando’s, Pizza Express, Frankie and Bennys, Chiquitos and many more!